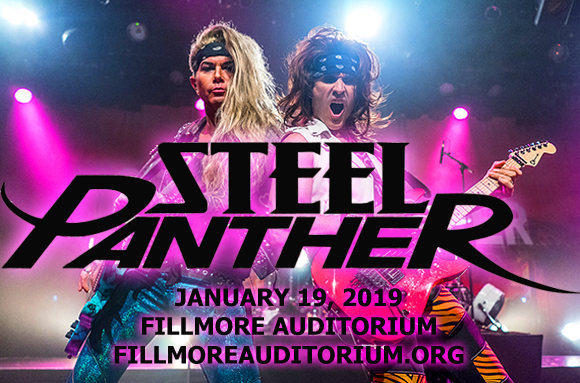 If you like your hair metal on the hilarious side, you're going to want to see Steel Panther at Fillmore Auditorium on Saturday 19th January 2019! Heading to Fillmore as part of their Heavy Metal Mardi Gras, the boys of Panther are ready to rock your world and party like it's 1979!!! Prepare yourself for filth, mayhem and rampant guitar solos, as this innuendo-fueled quartet get their groove on! Comedy glam metal band Steel Panther were formed in 2000 in Los Angeles, California, and formerly went by the names of Metal Shop, Danger Kitty and Metal School, before settling on their current moniker. Consisting of vocalist Ralph Saenz ("Michael Starr"), drummer Darren Leader ("Stix Zadinia"), bassist Travis Haley ("Lexxi Foxx"), and guitarist Russ Parrish ("Satchel"), Steel Panther self-released its debut EP, Hole Patrol, in 2003. Feel The Steel, their major label debut album, was released on Universal Records in June 2009, and featured guest appearances from Corey Taylor, Justin Hawkins, and M. Shadows. The album debuted at number one on the Billboard Comedy Chart. To date, the group has released four studio albums, their most recent release being 2017's Lower The Bar.